As I’m sure most of you know, I’ve wanted to visit California since I was a little girl. Since I started my career on the internet, I’ve talked about moving somewhere warm, most notably L.A. My dreams finally came true (sort of), and I was able to visit this beautiful city that I’d one day like to call home. We stayed at a couple of different hotels, and as part of my new blog, I’ve decided to write a little review of all the places. I know the hardest part about visiting a new city can be finding a nice place to stay, so I thought sharing my experiences and reccomendations would be helpful to a lot of you! The first hotel myself and my roommate/photographer/bff Nicole stayed at was called The Hollywood Hotel. It’s situated on North Vermont Ave in East Hollywood. It’s only a 10 minute drive to Central Hollywood and the Hollywood Walk of Fame, and just 15 minutes to the West Hollywood / Melrose area. There’s a lovely stretch of shops nearby and within walking distance as well. If you do stay at the hotel, I’d totally recommend eating at Green Leaves Vegan, which is vegan Thai food heaven, and only a 10 minute walk away! Next door was also the cutest hippy shop with meditation services, crystals, and all those fun/weird things! The hotel itself was incredibly beautiful and really provides a classic Californian experience, with beautiful architecture and touches of vintage Hollywood glamour throughout. It was hands down the most beautiful and well landscaped hotel I’ve ever had the pleasure of staying at. The lobby is warm and inviting, with a lovely California summery feel. There are large couches to sit and relax in whilst waiting for your Uber, along with high ceilings and an overall open bright feeling. The back entrance is equipped with a beautiful and large fountain. Every time I walked past it, I literally exclaimed “I love this fountain!”. The sound and smell of it alone was so peaceful and summery, and really filled me with joy. The parking lot was also beautiful. I know, a parking lot, beautiful? But seriously. The landscaping was done so well. There was an abundance of flowers, and large fern-like (not sure what kind of trees they are! Only ever seen them in Cali), surrounding the property. It felt very private, safe, and tropical. The pool area was also heaven. Like the parking lot, it’s surrounded by tall trees, offering an amazing amount of privacy. It’s easy to forget you’re in Los Angeles, and not in Hawaii or some other tropical destination. The pool chairs were so comfortable and cute (yellow and white stripes, like yes please!) The pool itself was a nice size, and a beautiful blue colour, and the area was always clean and equipped with fresh towels for drying off after a nice refreshing dip in the pool. Oh and don’t forget about this balcony. AMAZING VIEW. Flowers galore. Comfy chairs. Need I say more? On the morning of our last day, we discovered the courtyard. If only we’d found this sooner, because it is so beautiful and peaceful. Think tropical, Italy and California, all wrapped in one. There’s a bunch of couches to sit back and relax on and the area is full of flowers and palm trees, and even a large fountain in the centre (the most peaceful sound ever!) There’s also a bar that serves drinks during Happy Hour (from 5-7pm), with Hollywood director chairs (such a cute touch!). I could easily sip a cocktail and read a good book here all day. Some lucky guests also have their bedroom balcony open up into this area. Imagine sleeping to the sound of the fountain — must be heaven! Now lets talk about the room. Me and Nicole stayed in a Starlet Double Queen room on the 3rd floor. The room felt brand new and was totally modern, with grey laminated wooden flooring. It was the perfect size, with two white, super clean, large cozy beds. High ceilings gave the room a very airy and spacious feel, and the large window let in an abundance of natural light during the day. The curtains were crazy thick, so when you close them the room is totally dark — perfect if you need to catch up on some sleep during the day. We also had a view of the Hollywood sign and the Hollywood hills! The bathroom was also stunning! It featured white subway tiles on the walls, and a white and black designed tiling on the ground. It was spacious, large, and even had storage space for extra clothes. The shower was massive (I swear like the size of a queen bed) and had a rainfall shower head. The “ROAM” toiletries on offer in the bathroom were also great. Myself and Nicole were constantly revelling in how soft our skin was from the shower gel. The hotel also offers free wifi and breakfast. After staying at “fancier” and more expensive hotels, I can’t even begin to explain how much these freebies mean to me. I’ve stayed at places where they charge $10 per 3MB of internet (aka only enough to post one IG photo, which is not nearly enough, especially if you’re like me!). I’ve also stayed at plenty of hotels with a restaurant that has expensive breakfast options without much variety too. So to have these included in the already affordable hotel price is a huge bonus. The wifi at The Hollywood Hotel was fast and super easy to connect to. And though it didn’t apply to us, the hotel is also pet friendly! We saw a handful of adorable little puppies throughout our stay. The breakfast was served on the lower level of the hotel. The dining area was so beautiful, with vines hanging from the ceiling, and the architecture and overall design made you feel like you were visiting Tuscany, Italy. The breakfast had a large selection of food available. From cereals, breads, bagels, spreads, pastries, coffee, juices, omelettes, waffles, pancakes, oats and even soy milk, vegans and non-vegans alike can enjoy a delicious breakfast. It was self serve (so super quick if you’re in a hurry to start the day) and just overall very easy and convenient. We saved a LOT of money by taking advantage of the breakfast and it was the perfect way to start a busy day. Lastly, I want to touch on the lovely customer service we received during our stay. The maids in the hallway were so adorable and friendly, always saying “Hello!” “Good Morning!” or “Have A Good Day!” whenever someone would walk past. The receptionists we’re also so helpful and kind, and we never had to wait long to speak to someone. One of the receptionists complimented my outfit (so sweet!) and another told us about a service where you can hike with a dog to the Hollywood sign. She couldn’t remember the exact details, so she literally called our room later to fill us in with all the info, which was such a nice touch and really showed how much the workers care about their guests. Overall I’d absolutely recommend staying at this hotel if you’re looking to visit Los Angeles in the near future. If you have any questions about the hotel, be sure to leave me a comment or shoot me a message on social media. Hope this was helpful in some way and thank you so much for reading! For more info, you can also watch my daily vlogs from the hotel here, here and here. And check out the hotel's website and instagram! 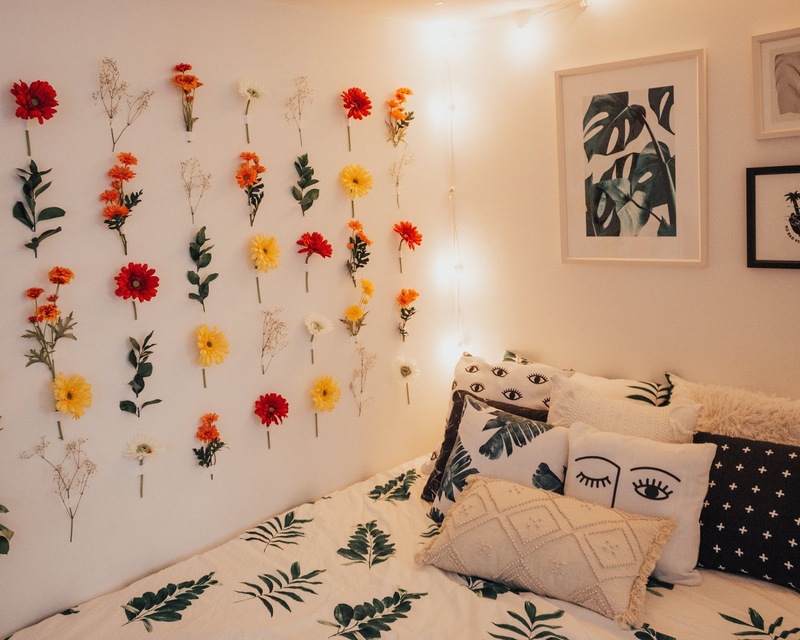 DIY Flower Wall: How To + Tips!